We decided to try the Sylvania Headlight Restoration Kit on a 2007 Camry. The Arizona sun has been hard on the headlights and the owner had tried once before to restore the headlights. Now was the chance to again test the Sylvania Headlight Restoration Kit. At last year’s SEMA and APEX shows, it seems that everybody had a headlight restoration kit. And if they didn’t have a kit, their older product could be used for that purpose too!! Sylvania’s kit comes with a liquid UV Block Clear Coat intended to keep the restoration from fading quickly. This sets them off from some of their competitors. The kit came with enough ample supplies to do the two headlights, sans towels and water. They give you a roll of rubber electrical tape to mask off nearby painted surfaces. We supplemented it with some blue “Painter’s Tape” as an extra caution. We have been really impressed with this headlight restoration kit, which we used before. We used it on a Toyota Sequoia always parked outside facing south into the harsh Arizona sun. It worked out perfectly and was still in factory fresh condition when we sold it two years ago. The first step is to spray their Surface Applicator over the headlight surface. This helps remove discoloration and soften the UV coating. The kit comes with three grades of sandpaper, 400-1000-2000 grit. Wet sand each headlight, starting with 400 and working up to the 2000 grit paper. They recommend sanding 2-5 minutes per headlight with each grit, using plenty of water and a circular motion. With water, the lens looked better, but as it dried the lens became opaque again. Then use a tan Clarifying Compound to polish the lens. This left the lens clean but with a slight haze after drying. Re-apply their surface activator to clean the lens one last time. Make sure the both lenses are dry before the last step. At this point you might be wondering, what did you do to the headlights? as they may not look crystal clear. But fear not! Use the UV Block Clear Coat to soak an edge of a folded paper towel and in one stroke wipe the top edge of the headlight. Continue to keep the edge moist and with a slight overlap, swipe the next portion of the headlight and repeat until all the lens is coated. Let dry for 4-6 hours to fully cure. In talking with the Sylvania pros, they proudly note that this final clear coat is what sets them off from the competition. The coating helps to keep the headlight pristine and prevents aging again. They are so confident in their kit they offer a lifetime warranty, which probably isn’t too risky for them. 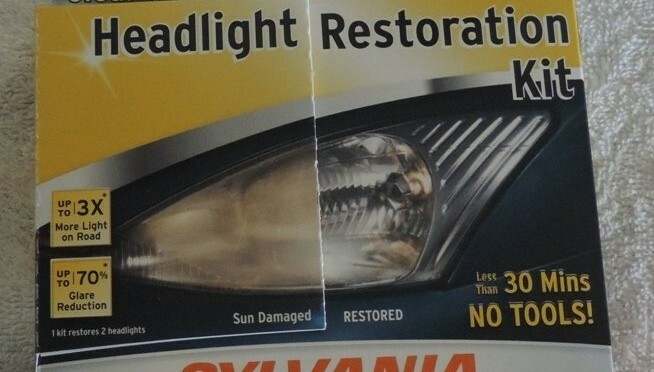 Not only do they offer a great product, but how many people will keep their cars another 4-5 years after doing the headlights the first time? It took about 45 minutes for both lenses and being careful to cover all the surface area of the headlights with the wet sandpaper. A close examination can show some scratches that didn’t come out, but from even a few feet they look like new. There was enough liquid to do both headlights and some surplus remained – which I used on a 2010 Camry that was showing signs of haze already. Guess the Arizona sun does a number on these headlights. Have you tried this kit from Sylvania or a competitor’s? What was your experience and outcome?